Forty-eight hours after the final whistle blew in Abu Dhabi, Palestine's Asian Cup hopes are finally dead and buried. There will be no Lazarus type comeback for the team who received a lifeline courtesy of a late, late goal by Tom Rogic against Syria. All in all, the mission for Palestine was to find a way to win a game at the Asian Cup. They may have avoided defeat on two occasions but Al-Fida'i failed to score a single goal; a feat they accomplished in 2015 when Jaka Ihbeisheh scored a late consolation goal in a 5-1 rout at the hands of Jordan. Palestine needed two draws in the remaining matches between third and fourth seeds in Group C, D, E, & F- all of whom where on zero points going into the last match day. All four encounters produced winners- sealing Palestine's fate. If the 0-0 draw against Jordan was the last match with Noureddine Ould Ali at the helm then it was an appropriate scoreline. The Algerian now shares the record for most draws (7) by any national team manager in Palestine's history- he shares the record with Jamal Mahmoud but has set the number after 17 matches in charge- half the number of the 34 official encounters Mahmoud had. In the end, the writing was on the wall- with events set in motion with the Christmas Eve firing of Abdel Nasser Barakat. Julio Baldivieso was quickly dispatched after two games but the decision to return the staff without its leader was an erroneous one. If Ould Ali could be given credit for anything its the fact that the national team was fit as a fiddle at this tournament- not exhibiting signs of exhaustion after 60 minutes that plagued the more established squads such as Syria. 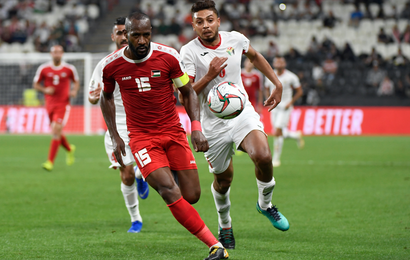 The negatives outweighed the positives though and his decision to play Musab Al-Battat- Palestine's best player against Jordan as a centerback against Australia will forever be questioned. Why exactly he chose to take an injured Daniel Kabir Mustafá to the tournament will be another point of contention. As was the inclusion of other players who visibly unfit- the invisible Pablo Tamburrini and Alexis Norambuena who sowed up to the Qatar camp overweight. Those names ended up taking up spots that could have been given to younger players or real difference makers. Captain Abdelatif Bahdari pleaded with Noureddine Ould Ali to bring Al-Jazeera winger Islam Batran to the tournament but to no avail. Batran wasn't the only attacking name left off the squad for inexplicable reasons. The loss of Mahmoud Eid, Ahmad Awad, Matias Jadue, Saleh Chihadeh, Islam Batran, and Hilal Mousa ended up being the gain of Khaled Salem- a player who did absolutely nothing in the 120 minutes of play he was given as a substitute. During the post match press conference after the Jordan match Ould Ali expressed no regrets as to his decision: "This isn't a love story; regrets are for love stories not football" the Algerian stated tersely. There was also a verbal confrontation with a BeIN reporter outside the stadium as the visibly upset Ould Ali found it hard to come to terms of Palestine's probable exit. The deployment of Alexis Norambuena as a centre midfielder only served to sew seeds of discontent amongst the actual midfielders in the side. After getting completely blasted against Syria, Alexis was back out again in his natural position as Musab Al-Battat became a makeshift centreback. His lack of fitness led to Chris Ikonomidis having the game of his national team career to date. The damage it did to the team on and off the pitch was nearly irreparable. Al-Battat had not trained as a CB once and he was suddenly starting ahead of an established veteran in Tamer Salah who alongside Daniel Kabir Mustafá, Jaka Ihbeisheh, and the goalkeepers did not even warm up once during the competition. The Algerian was seen as duplicitous having gone back on several of his promises to players- Amr Kaddoura was told he would be given a debut in the warm up friendlies only for Ould Ali to go back on his word. When the tough decision was to be made Ould Ali resorted to trying to fit square pegs into round holes in order to avoid confrontation. Yashir Islame was played as a number 10 in the pivotal match against Jordan when he should have been deployed in his natural position, or in a different formation alongside Mahmoud Wadi, or on the bench. This was despite the fact that a gem of a talent in Nazmi Albadawi had just been recruited with an eye to providing quality service and tempo setting at the position. Despsite the elimination, there were some positives that could be harnessed for the future. Rami Hamadi and the defence did what was asked of them. Abdelatif Bahdari turned back the clock with a man of the match performance against Syria. His partner, fellow Gazan Mohammed Saleh, will be left to carry the mantle. The young man once known for his gaffes in defence has grown by leaps and bounds in the past 18 months and his move to the Maltese league should only help further that development. The fullbacks, when given the license to go forward were immense. Musab Al-Battat and Abdallah Jaber learned on the job in Australia but they are now the veterans who will lead the team during the next cycle. The revelation of the tournament, Mohammed Rashid also showed himself capable of partnering Mohammed Darwish in midfield. He will be a welcome addition to a position that previously lacked depth and should feature regularly going forward. Al-Fidai's traveling and expatriated fans were immense as always and having spoken to several national team players their biggest regret was not being able to reward their vociferous support with a goal. Palestine's path forward will now begin with the search for a new manager to lead Palestine's most talented generation as they attempt to advance to the Third Round of 2022 World Cup qualification and push for a better finish to the next four year cycle.